The 1987 World Series was played by the Minnesota Twins and the St. Louis Cardinals. Minnesota was victorious in a World Series that was both the first to feature games played indoors, as well as the first in which the home team won every game. This happened again in 1991 (also a Twins championship) over the Atlanta Braves and in 2001 with the Arizona Diamondbacks defeating the New York Yankees. The World Series win was the first for the Twins franchise since 1924, when the team was located in Washington, D.C., and was known as the Washington Senators. This is the first World Series in which the series logo appeared on the jerseys; only the Cardinals wore it, however, while the Twins did not. 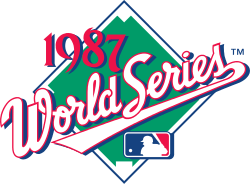 The 1987 World Series was notable in several regards: It featured the first World Series games played in an indoor stadium (the Hubert H. Humphrey Metrodome) and the final game of the series to start earlier than prime time in the eastern United States (Game 6 would start at 4:00 p.m. ET/3:00 p.m. CT), and it was the first World Series in which all games were won by the home team (Four previous series had the home team winning the first six games, including the 1965 World Series, when the Twins dropped Game 7 to the Dodgers). The bottom half of the ninth inning was never played in any game of this Series, and this was the first and only time this has ever happened. In 1987, the Twins set the record for the worst (full 162 game) regular season win-loss record of any World Series championship team (85–77, .525). This record stood until it was broken when the Cardinals won the 2006 Series after going 83–78 (.516). However, the latter was due to the incorporation of the Wild Card Draw, which did not exist in 1987. Besides setting a record for the worst ever regular season winning percentage for a World Series winner and hosting the first ever World Series game indoors, the Twins were the first team to ever enter the World Series having been outscored in the regular season. The Twins, as a team, were pretty much outnumbered in virtually every major statistical category in 1987. As ABC play-by-play commentator Al Michaels put it in the pre-game show for Game 1 "They were out everything!" The Cardinals posted a 95–67 record during the regular season, but were affected by injuries throughout the postseason, most notably with the loss of their lone home run threat, first baseman Jack Clark, due to a sprained right ankle suffered in a game in Montreal on September 9. During the regular season, Clark led the National League in both on-base percentage and slugging percentage despite playing in Busch Memorial Stadium, which was reputed to be the league's most extreme "pitcher's park." He hit 35 home runs in 131 games, and was the only person on the team to hit more than 12. The player on the team who hit 12, starting third baseman Terry Pendleton (though named to the World Series roster) was hampered with a ribcage injury. Normally a switch-hitter, Pendleton was only able to swing lefthanded during the World Series and was also unable to play the field. The Cardinals replaced Clark on their World Series roster with 36-year-old Dan Driessen, who was a starting major league first baseman from 1977 through 1985, but was released by two organizations in 1986. The Cardinals had signed Driessen to a minor league contract on June 9 and called him up to the majors on September 1. The 1987 World Series should go down in history as one of the least suspenseful World Series of all time even though it ran seven games. There were no extra-inning games. No runs were scored in the 9th inning of any game. No runs scored in the 8th inning of any game caused a lead change; therefore this series might as well have been played in seven-inning games. Only one game—number three, in St. Louis—featured a lead change in the 7th inning, and only two other games, Game 5 in St. Louis and Game 7 in Minneapolis- featured a lead change in the 6th inning. Game 7 was the only game in which the teams were tied at the end of the 5th inning. Four of the games were essentially over by the 4th or 5th inning, as no scoring after that affected the outcome of those games. Yet there was controversy during the series concerning whether the Metrodome's technicians had been instructed by administration to turn the stadium fans on or off during gameplay to aid the Twins. It was revealed in 2003 that this had, in fact, occurred. Game 7 was won by Minnesota on the 35th birthday of the Twins' Roy Smalley – and was also the last game of his career. Smalley appeared in four games as a pinch-hitter and reached base all four times on a double, an error, and two walks. A raucous, sold-out Metrodome met the Cardinals on October 17, stunning them at times with the sheer noise. The crowd noise in the Metrodome could exceed 110 decibels, which is about the same as what a jet plane makes when it takes off. Their play was marred with numerous mistakes brought by the Dome's fast AstroTurf and white roof. The Twins' aggressive play hardly helped the Cards at all, and the game was a 10–1 blowout. Starting pitcher Frankie "Sweet Music" Viola put the lights out on the Cards easily. Dan Gladden hit a grand slam home run capping off a seven-run fourth inning and Steve Lombardozzi added another two-run shot. Frank Viola was supposed to be the best man at his brother's wedding, but had to back out when the Twins reached the World Series, since it fell on the same night as Game 1, which he was scheduled to pitch. ABC showed clips of the wedding throughout the game's broadcast. While improving on their game one performance, the Cards were unable to hold the Twins offense again and fell behind 7–0 before beginning to rally. The Cards' total of nine hits was just one short of the Twins but their bats lacked power as they managed only one double against three doubles and two home runs hit by Minnesota. The Twins broke the game open in the fourth, scoring six runs and chasing starter Danny Cox from the game. The final score was 8–4. Randy Bush and Tim Laudner each came through with a pair of two-run-scoring hits in the fourth. Traveling down the Mississippi, to the open air of Busch Stadium, Game 3 saw a tense pitching duel between Twins starter Les Straker and John Tudor of the Cardinals. Les Straker was the first Venezuelan to pitch in the World Series. After five scoreless innings by both teams, the Twins broke through in the top of the sixth inning. Tom Brunansky's RBI single looked like all the offense the game would see. But, in the bottom of the seventh, Juan Berenguer, in relief of Straker, surrendered leadoff back-to-back singles to Jose Oquendo and Tony Peña. Terry Pendleton sacrificed the runners to second and third, and Vince Coleman slammed a two-run double to give the Cards a 2–1 lead. Ozzie Smith followed by singling in Coleman for the final run, and Todd Worrell closed out the win for Tudor. In Game 4, Tom Lawless hit a three-run homer off Viola (only his second Major League homer after going 2 for 25 during the regular season) in the fourth inning, one of Viola's five earned runs in the game. Just prior to Game 4, Reggie Jackson, who was working as a field reporter for ABC's coverage of the 1987 World Series, admitted that he didn't know who eventual Game 4 hero Tom Lawless was. Game 5 was a much closer ball game, but eventually the Cardinals were victorious, by a score of 4–2. Curt Ford hit a two-run single in the sixth, breaking a scoreless pitcher's duel between Danny Cox and Bert Blyleven. By the end of the seventh, the Cards were up 4–0. The Twins scored two in the eighth on a triple by Gaetti off reliever Todd Worrell and made a game of it but eventually relinquished the save to him. The Cardinals stole five bases in Game 5, the most for one team since the 1907 Chicago Cubs. Cardinals Second Baseman Tommy Herr. The Series returned to the Metrodome with the Twins facing elimination (a position they would find themselves in once more four years later against the Atlanta Braves). ABC allowed the game to be played at 3 p.m. CT (4 p.m. ET) on Saturday afternoon – the only day game of the series, and the last World Series game to date to be played in the daytime (although as the game was played in the Metrodome, the game took place under artificial illumination all the same). The Cardinals drew first blood off Les Straker on a Tommy Herr home run in the first, and the Twins countered with two in their half of the first on RBI singles by Kirby Puckett and Don Baylor. The Cardinals quickly tied it in the second on a Jose Oquendo RBI single. In the fourth, the Cards chased Straker when Dan Driessen led off with a double to right and went to third on a Willie McGee single. McGee took second on the attempted throw home by center fielder Kirby Puckett. Terry Pendleton followed by singling home Driessen and Oquendo hit a sacrifice fly to make it 4–2. Another run scored for the Cards in the fifth when lefty Dan Schatzeder walked Ozzie Smith. Smith went to second on a groundout, to third on a flyout, and scored on another McGee single. But, in the bottom of the fifth, the Twins began to claw back against John Tudor. Puckett led off with a single and was doubled in by Gary Gaetti. Benefitting from use of the designated hitter in their home ballpark, the Twins then tied it on a mammoth home run by their DH, Don Baylor. After Tom Brunansky followed with a single, the Twins took the lead for good when Steve Lombardozzi singled him with two out on a close play at the plate. The Twins then blew the game open in the sixth. Greg Gagne led off with an infield single and Puckett walked. A passed ball by Tony Peña advanced the runners. With first base open and one out, Cards veteran Bob Forsch intentionally walked Baylor to load the bases. After Brunansky popped out, left-hander Ken Dayley was brought in to face the lefty-hitting Kent Hrbek. Hrbek finally broke out of his batting doldrums and hit a grand slam and essentially put the game out of the Cards' reach. Brunansky drove in the final run in the eighth and the Twins had staved off defeat. The 500th World Series game ever played, Game 7 forced a National Football League game between the Denver Broncos and the Minnesota Vikings, originally scheduled for that afternoon at the Metronome, to be played the following night (also on ABC). Joe Magrane of the St. Louis Cardinals became only the sixth rookie pitcher to start the seventh game of a World Series. He also is the only pitcher in World Series history to start Games 1 and 7 of a World Series without any starts in between. Magrane had actually started the 1987 season pitching for the Cardinals Triple-A team, the Louisville Redbirds. In the second, the Cardinals looked poised to send Frank Viola to an early shower. Three straight no-out singles by Jim Lindeman, Willie McGee, and Tony Peña plated the first run. Viola settled down to retire the next two hitters, but then Steve Lake singled in McGee for a 2–0 lead. Viola would settle into a groove, however, and allow only two more hits and no runs in eight strong innings. The Twins came back in their half of the second on a Steve Lombardozzi RBI single, but not before a missed call at home plate by umpire Dave Phillips had already cost the Twins a run. Twins DH Don Baylor reached base on a hit-by-pitch by Magrane to lead off the inning and Tom Brunansky singled him to second. With one out, Tim Laudner singled to left and Baylor was gunned down at home by Vince Coleman in left, but replays clearly showed that Baylor was safe. Lombardozzi then singled in Brunansky. In the fifth, the Twins tied it when Greg Gagne reached on an infield hit and Kirby Puckett drove him in with a double. Incidentally, Cardinals fans believed replays showed Gagne to be out on his infield hit, thus this run served to counteract the run the Twins lost in the second on the missed call on Baylor at the plate. The Twins seemed on the verge of taking the lead when Gary Gaetti followed Puckett with a walk and went to second when Puckett was thrown out by Lake trying to advance to third on a wild pitch that was deflected when it hit the home plate umpire in the face-mask. Baylor followed with a single to left, but Coleman threw out Gaetti at the plate in a violent collision with Lake. Coleman became the first outfielder to throw two runners out at the plate in one World Series game. 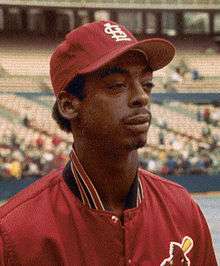 Final out victim Willie McGee. The sixth inning proved to be controversial. In the top of the sixth, Tom Herr was picked-off of first base, and called out. In what Cardinals fans believe was the third missed call of the game, replays supposedly showed Herr to be safe. Umpire Lee Weyer's view was blocked by Kent Hrbek who, according to the broadcast crew, not only made the tag late, but might also have been called for interference as he stood in Herr's path during the run-down before he had the ball. Had this been called, Herr would not only have been safe, but been awarded second base, and the Cardinals would have had a runner at second with one out. As it was, the Cardinals would score nothing. The Twins then took the lead in the bottom of the sixth, off Danny Cox, who had relieved Magrane the previous inning. Cox walked Brunansky and Hrbek to lead off, and was replaced by Todd Worrell. As Cox was leaving, he got into an argument with home plate umpire Dave Phillips and was ejected as he was leaving the field. After retiring the first batter he faced, Worrell walked pinch-hitter Roy Smalley to load the bases and then gave up a two-out RBI single to Gagne. The Twins' final run came in the eighth on an RBI double by Dan Gladden. Jeff Reardon retired the side in the ninth to give Minnesota their first World Series victory. Twins manager Tom Kelly became the youngest non-playing manager to win the World Series since John McGraw in 1905. Although Steve Carlton was not on the Twins' playoff roster, he still attended the White House to be congratulated by President Reagan. While making a photo op with the president, local newspapers listed the names of all of the Minnesota Twins. The only man who wasn't listed (and simply identified as a Secret Service agent) was a tall man wearing dark sunglasses in the back. The man in question was Carlton. After their defeat in the '87 Series, the Cardinals' reign of dominance in the '80s ended. They would not win their division until 1996 and they would not return to the World Series until 2004. In 1988, the Twins actually won more games than in their championship season, finishing with a 91-71 record. They finished 13 games behind the AL West champion Oakland A's, who won 104 games. The Twins eventually sank towards the bottom of the standings, finishing last in 1990. In 1991, the Twins returned to the playoffs by beating the Blue Jays in the ALCS and winning what many call the greatest World Series ever played over the Atlanta Braves. The 1987 World Series featured at least two players who would go on to win Manager of the Year awards. The Twins' Don Baylor won it in 1995 for his work with the Colorado Rockies while the Cardinals' Tony Peña won it in 2003 for his work with the Kansas City Royals. The success of the 1987 Twins inspired Brandon Walsh (Jason Priestley) in Beverly Hills 90210 to explain why the Twins were the ultimate definition of a team, thus enabling him to win the Dreyer Scholarship. However, his interview included a factual inaccuracy; he said Gladden hit a grand slam in the pivotal Game 4, when in fact Gladden hit one in game 1, and Hrbek hit one in the pivotal game 6. In a February 2015 interview, sportscaster and author Al Michaels (who, as previously mentioned, did play-by-play for ABC's television coverage of the 1987 World Series) alleged the Twins pumped artificial crowd noise into the Metrodome during the 1987 World Series. ↑ Nemec, David; Flatow, Scott. Great Baseball Feats, Facts and Figures (2008 ed.). New York: Penguin Group. p. 365. ISBN 978-0-451-22363-0. ↑ "Ericson admits to adjusting ventilation system". ESPN. ESPN. July 26, 2003. Retrieved March 24, 2015. ↑ "1987 World Series Game 1 - St. Louis Cardinals vs. Minnesota Twins". Retrosheet. Retrieved September 13, 2009. ↑ "1987 World Series Game 2 - St. Louis Cardinals vs. Minnesota Twins". Retrosheet. Retrieved September 13, 2009. ↑ "1987 World Series Game 3 - Minnesota Twins vs. St. Louis Cardinals". Retrosheet. Archived from the original on September 25, 2009. Retrieved September 13, 2009. ↑ "1987 World Series Game 4 - Minnesota Twins vs. St. Louis Cardinals". Retrosheet. Retrieved September 13, 2009. ↑ "1987 World Series Game 5 - Minnesota Twins vs. St. Louis Cardinals". Retrosheet. Retrieved September 13, 2009. ↑ "1987 World Series Game 6 - St. Louis Cardinals vs. Minnesota Twins". Retrosheet. Retrieved September 13, 2009. ↑ "1987 World Series Game 7 - St. Louis Cardinals vs. Minnesota Twins". Retrosheet. Retrieved September 13, 2009. ↑ "ESPN.com - MLB Playoffs 2002 - Calm, cool Lackey looks anything but a rookie". ↑ "World Series Gate Receipts and Player Shares". Baseball Almanac. Archived from the original on May 2, 2009. Retrieved June 14, 2009. ↑ "Al Michaels says Twins pumped fake noise into 1987 World Series". Neft, David S.; Cohen, Richard M. (1990). The World Series (1st ed.). New York: St Martins. pp. 419–424. Forman, Sean L. "Major League Statistics and Information: 1987 World Series". Baseball-Reference.com. Archived from the original on December 17, 2007. Retrieved December 9, 2007. History of the World Series - 1987 at The SportingNews. Archived from the original on 2008.